Chris called me in the middle of the week. He was the project manager of a heavy industrial construction company in the Pacific Northwest. His company works on large-scale projects for commercial business enterprises and government agencies, much of their work in the Snake and Columbia River Dam. They also deal with the industrial plant maintenance industry in applications such as Converting Waste to Energy, Aluminum Production, as well as Plywood Mill and Lumber. The filtration unit needed to be portable. It needed to have an electric motor with an on-off switch. It needed to have a power cord at least 30-feet long (SFC has a 40′ power cord). It needed to be compatible with 110-volt, single phase electricity input power. Its flow rate needed to be 1 GPM (SFC comes in 1-, 5-, 11-, or 22-GPM standard pumps). It needed to be compact enough to maneuver through 30-inch doorways. Upon reading the requirements I thought it appeared as if they had copied verbatim from the PDF brochure of our SFC Spin-On Filter Cart! 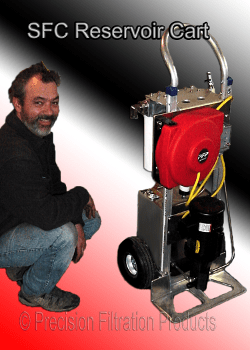 Chris also needed a Hydraulic Fluid Reservoir, which was something new for me, and for which I had never provided a price quote in the past. The reservoir needed to hold 5-gallons, nominal capacity, and also be made of steel. I determined the size that the reservoir needed to be and then decided to use a stainless steel that would be clean and have a bright metal finish like Chris wanted. Then I had to take some measurements and figure out where to mount the reservoir on the frame of the SFC filtration cart. Next I had to determine where we would mount it on our unit and I was able to take dimensions and determine how we would attach it into the frame of our custom portable filtration cart. Chris also specified that he needed something to remove dirt and moisture from the incoming air so I ended up incorporating a desiccant air breather. The particular breather that I included also provides a visual indication of the desiccant as well as the condition of its filter. We also made sure to use a clear fluid level indicator for the reservoir that was flexible enough to bend and follow the contour of the tank without breaking. 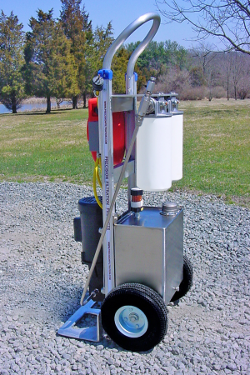 Do you have a question about mobile filtration systems or filtering hydraulic oil? Feel free to contact us anytime. Our friendly team of experts will be happy to help you out with your particular issue.